There are a couple reasons we’re talking about blood donation this week. For starters, it’s always a good idea to remind everyone to donate blood. Come check out the new state of the art ER in Coppell, and help save a life while you’re there! Sign up for an afternoon spot in the schedule, here. Blood cannot be manufactured, yet—it can only come from generous volunteer donors. In fact, if you began donating blood at age 17 and donated every 56 days until you reached 76, you would have donated 48 gallons of blood, potentially helping save more than 1,000 lives. Donating blood is an easy, three-step process. Hydrate: On the day of your donations, be sure to drink plenty of fluids. Wear something comfortable: Remember you’re going to be rolling your sleeves up. Boost your iron, if possible: In the weeks prior to your donation, try to include iron-rich foods in your diet. Bring: A list of medications you may be taking, your ID, and a friend to tagalong—so you can both enjoy the gratification of giving blood. Paperwork: Reviewing basic eligibility requirements and present ID. 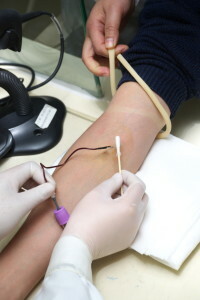 Health history and mini-physical: Answer a few confidential screening questions and get your blood pressure, pulse, and hemoglobin levels checked. Rest and recharge: Enjoy a snack and drink to restore your energy and leave the area within 15 minutes feeling instant gratification knowing that you’ve helped save lives. 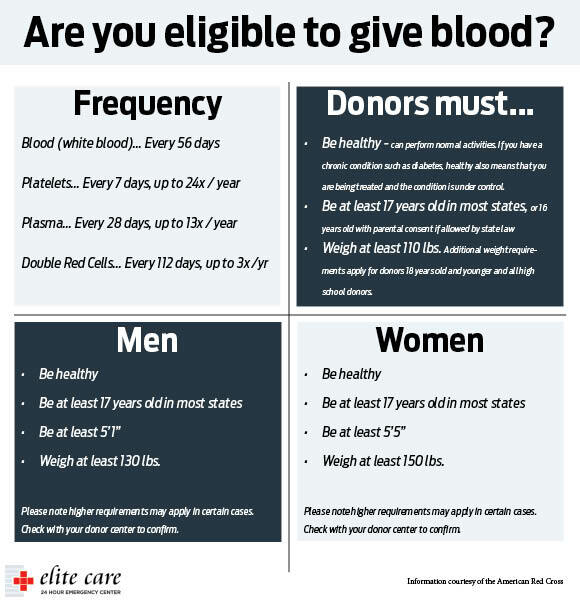 If you’ve been deferred from donating blood and still want to help, the American Red Cross has a list of temporary and permanent options to consider.